The purchase of lilies for our garden started both because of the appearance of the dignified and regal form of the flowers and plant, and because of the heady fragrance. 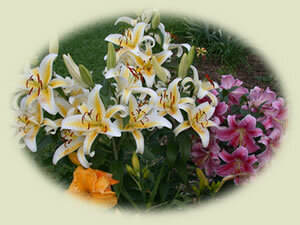 Some daylilies do have fragrance, but it isn't one of the more noticeable attributes. I wanted more fragrance in my garden, and as I wasn't getting enough of it with the daylilies by themselves, I decided to investigate other plant species to see what I could add to the garden to give me widespread fragrance. Lilies were not only very fragrant, but they seemed to be a very good companion plant that could be a back of the border plant with daylilies planted in front. 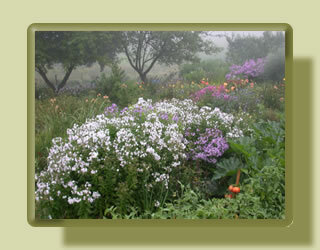 The daylily foliage would cover the lower stem of the lilies, while the lily bloom would be suspended above the daylily. As Lilies are relatively new to our garden, we haven't managed to take very many photos of them. We are hoping to be able to greatly improve the Lilium photo gallery in the upcoming summer seasons. The recent spread of the Red Lily Beetle has been a severe deterent for gowing lilies in the garden. This pest can not be ignored! If you wish to have lilies in your garden you will have to be alert to them and either pick the beetles and or larvae (or find another means of getting rid of them such as spraying with pesticides) or your plants will be destroyed. It is unfortunate and makes a lot of extra work when growing as many plants as we do, but so far we have decided that we love the flowers and fragrance enough to continue being vigilant with the Red Lily Beetle. Joining the North American Lily Society (NALS) has opened up many opportunities for us to meet other lily growers. Although we have been unable to attend regularly scheduled meetings, or conferences due to our schedules, we have met and visited lily lovers as far away as Minnesota! It has been such fun and we encourage you to give it a try too. The members have a wealth of knowledge and love to help newbies such as we are. The web address for the NALS site is www.lilies.org. Take a look and see what you think.